About Fly-EndHow Does It Work? Once the string has reached maximum fly capacity, one simply turns the handle a couple of times to obtain a fresh stretch of string ready to catch more flies. The fly string method is easy and amazingly effective: an adhesive-coated plastic string is installed above and close to the ceiling, throughout the entire premises. Following their natural instinct, flies land on the band, where they remain stuck. The effect is general rather than local, flies are eliminated continuously and everywhere. This ensures a rapid and lasting reduction in the fly population. The robust construction guarantees long and problem free functioning. 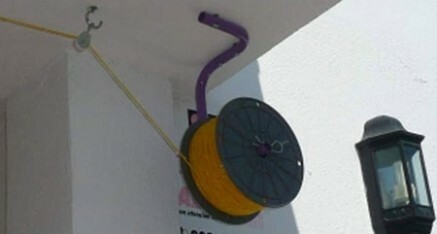 Fly string is easy to install and use. The Fly-End String System makes fly control the easiest thing in the world. REF: 5210 PRICE….€126,44 inc. IVA @21% + FREE FITTING !! 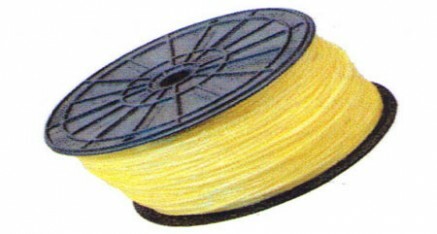 A standard spool which fits to the Fly-End Fly String System. Five hundred metres of feromone enhanced glued string that guarantees you fly free al fresco dining for one year, 18 months,two years ?? Who knows how long it will last you!The most important thing to know is that it works,and works out at just a few cents a week – – miles cheaper than buying smelly and dangerous sprays!! Copyright © 2013 NPS Pest Control. All rights reserved.